See self-made porcelain set for soap, AS and the brush. 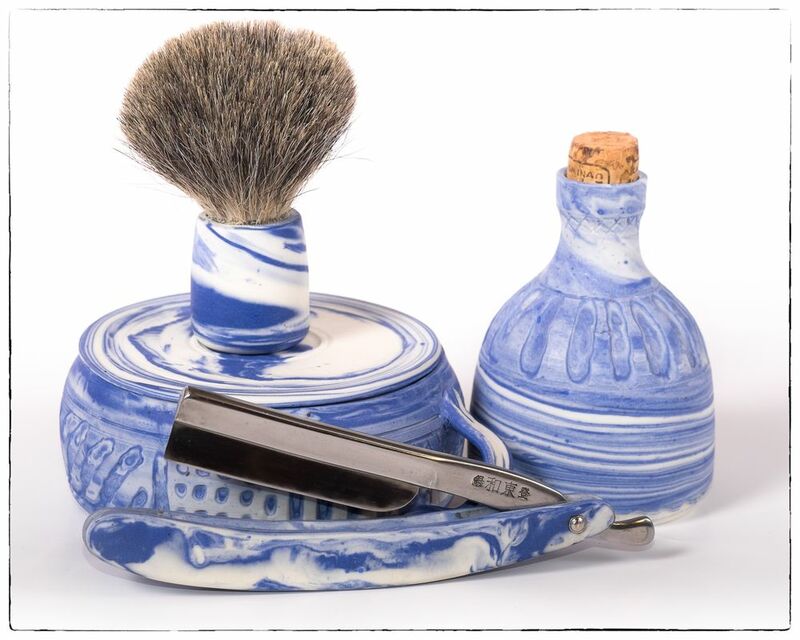 The extra item is the razor with porcelain scales. It took me long to make it it get to final stage. But i works perfectly. Really, really, really nice stuff. Gorgeous. I'd be that guy who would drop each and every one of them and have nothing at the end of the day. I love that you included an aftershave bottle. Awesome. Those are really striking. Very attractive and unique. I've never seen porcelain scales before. How did you pin them without breaking the porcelain? Carefully, and all the times preparing myself for failure. A bit later I could see my 8 years old son hammering the scales, not the pins. That led me to the conclusion that I could have made the scales thinner. You can see it partially here.